Mehek is the youngest of three siblings who lost her father at an early age. This family lives in Shimoga and her mother is an Egg merchant who sells Eggs roaming around in the streets and reaching out door to door. She was barely able to meet the needs of her 3 children when this news of Mehek having Blood cancer struck upon the family. 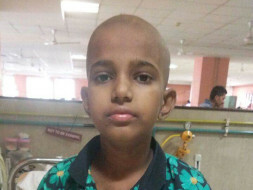 Mehek is being treated in Manipal (150 kms away from Shimoga) and has already spent close to a month in the hospital exhausting whatever little savings they had. The other 2 children are staying in Shimoga and are at the mercy of neighbours for all their needs. This mother is finding it extremely difficult to cope with this challenge and the cost of medication is mounting up day by day. 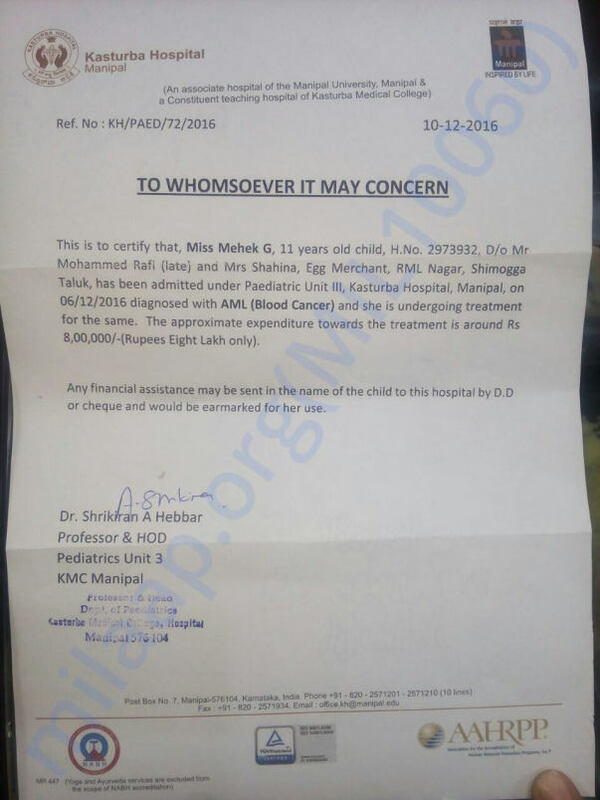 She is in urgent need of your help to save her child. Below are the bank details of Mehek's mother to which you can transfer the donations. If you wish to directly transfer the donations to hospital through a cheque or DD, please use the below details. Here is an update regarding Mehek’s health. Mehek is undergoing a course of chemotherapy for 6 months. She has finished almost 4 months of this course. In this process, she is under medication for a week and the next week she undergoes check-ups. This week-cycle continues alternatively. Her mother says that she has seen drastic improvement in Mehek’s health. Even the doctors are of the view that there is improvement in her health.But she has been facing slight side-effects from the on going medication in which she feels nervousness and lethargy sometimes along with pain in eye and tooth ache. The doctors are providing medication for that too. Mehek’s older sister has been staying with her in the hospital. She keeps Mehek company and her mother thinks it’s because of that she has been feeling better. Her mother is also very thankful to the staff of the hospital since they have been extremely helpful towards them. Mehek will be discharged from the hospital in 2 more months and will have to visit the doctors for follow-ups. Thankyou for the wonderful support you have shown. May Allah accept my apologies. May Allah give that child bright future and give strength to her family. May God bless u angel...get well soon..